What will the Olympics change? First things first: Oscar Pistorius has qualified for the World Athletic Championships and is now the second fastest 400m runner in South Africa, which means he will probably be competing in London. We had quite an Olympicy weekend. On Saturday we went to a forum at Rich Mix about the Cultural Olympiad. I tried to ask what the Cultural Olympiad was about referencing the Olympics original intention as a peace mission and its reincarnation as a youth education project (I think this is the key problem with the cultural Olympiad, not that people haven’t heard of it) but didn’t get a very clear answer. It made me wonder what all the people who did know what it was, actually said! It seems to be a load of entertaining cultural stuff that’s happening in Summer 2012 – some of it is free and some of it you have to pay for. The good things about the cultural Olympiad are that some things that wouldn’t have happened, will happen. E.g. Radio 1’s Big Weekend in Hackney. The less good things are – it doesn’t really make sense as a concept because it’s a load of things that have just been re-branded Olympic for 2012. And it’s also a bit disappointing that there doesn’t seem to be a strategy or an approach to keying all these events into creating opportunities for young people to get involved and have new practical experiences. The organisers tend to blur the idea of ‘participating’ in the cultural Olympiad with just ‘going to an event’ – which to me seems a bit slippy. 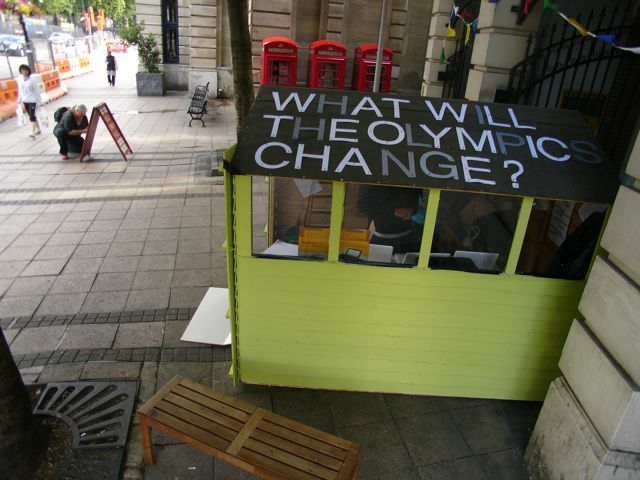 On Saturday we went to Stratford with the SMJs to find out what the Olympics will change. See photo at the top. This chimed with some questions I was asked for a South American news service thing. I’ve pasted in the two questions and my answers below. Do you think Olympic Games bring economic benefits to those who host them? Yes, of course they do. But can you fully measured them? No. Most economists will tell you that the economic benefits of hosting the Olympics are over stated but that’s because most of the benefits of the Olympics are very hard to measure. There is no formula for prestige, global recognition and attention, new relationships, and inspiration the Olympics bring. The Olympics are a cultural event – we like them because they are a way of understanding who we are. They are about learning and it’s nigh on impossible to measure the value of learning. How do you put a price on an amazing book you read, or something a teacher said to you at school, or a play you saw, something your grandad told you? Politicians justify the games on the basis that they encourage X many tourists, or X amount business investment, or they can do great things for a deprived part of the city, but really they bid for the games because they like them, for all kinds of cultural reasons that you can’t simply explain with economic formula. That’s why in London, despite the huge increase in the costs of staging the games (if you believe the opinion polls) people still support them. Listen to Tony Blair talking about why London bid for the Olympics:‘The person Blair is keener to talk about is his wife Cherie and her part in 2012. “She was very passionate about the Olympic bid. When I discussed it with her before we agreed to go for the bid, she was wildly enthusiastic. She said, ‘Go for it, it’s the greatest sporting event in the world, why on earth not? If the people in London and the athletics people are prepared to get behind it, why should we not do it?’ I was frankly worried it was going to take up a lot of time and we’d fail. But she rightly said, ‘Well you don’t succeed unless you’re prepared to fail, so give it a go’. It’s not like they did a cost-benefit analysis – it was just like ‘why on earth not?‘. But just because there are economic benefits, doesn’t mean that they always go to the right people. The London Olympics is supposed to be helping East London (the poorer side of the city) to get on a level with the rest of the city. It is also supposed to be benefiting young people. But the reality of the games is that meeting the deadline rules – tearing places up and building new ones against an immoveable deadline is not a sensitive process. It becomes much harder to do things ‘with people’ and much easier to do things ‘to them’ – especially when you are supported by an act of parliament. The Olympics will accelerate a process that is already in place – the migration of middle class people, like me, eastwards. But whether it will really improve the lot of people growing up in East London today – who knows? The fact that so few people who live around the Olympic Park have been able to actually get tickets for the games exacerbates this perception. It may just be that we are impatient and that we need to wait a long time to see the difference the Olympics will make to people living around the Olympic site, but I think as a process the Games gives benefits to people who already have power. They don’t give power to the weak. Does it bring happiness to the population? How can it not? Whatever you think about the corporatisation of the Olympics, the huge construction projects, the political grandstanding – at the heart of it are amazing people doing amazing things. When else does the whole world look at the same place for two weeks? I think you’d have to be particularly cold-hearted not to enjoy it. Providing there isn’t a horrific terrorist atrocity I think you’ll see people all over the country finding their own way to enjoy this thing. I know alot of people here claim that they aren’t excited about it, but alot of people said the same about the Royal Wedding this year and most people ended up having a pretty good time. The fact that people are incensed that they haven’t been able to buy tickets for sports that they would never normally watch suggest that there will be a big appetite for fun here, even if it won’t be quite as big as yours in 2016!! Today (monday) England are playing a Test cricket match against India at Lords – there were people started queuing to get into the ground at 2am this morning and there are as many people supporting India as there are people supporting England. It’s a brilliant thing – and the kind of thing that many of us like about this country and this city Hopefully the Olympics will be like that too.